Yes campaigners with their posters celebrating their win in Dublin Castle in May. THE SUPREME COURT has said it would not hear a Dublin woman’s appeal to challenge the Eighth Amendment referendum result in a ruling today. 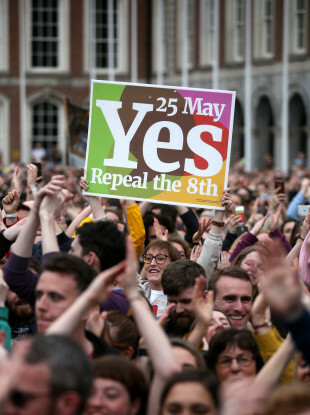 The ruling means the abortion legislation can now be introduced in Ireland, following the passing of a referendum to repeal the amendment in May. The challenge had been taken by Joanna Jordan, from Upper Glenageary Road in Dun Laoghaire, who complained about irregularities in voter numbers and that Health Minister Simon Harris had made “unlawful interference” in the outcome of the vote. However, the court decided today to dismiss her appeal, saying Jordan had not met the constitutional criteria to appeal the result. In their judgement, Chief Justice, Mr Justice Frank Clare, Mr Justice Donal O’Donnell and Mr Justice Peter Charleton said Jordan did not show grounds that raised issues of public importance or establish that an appeal was necessary in the interests of justice. Taoiseach Leo Varadkar welcomed news of the decision, saying that the repeal of the amendment could be signed into law and ratified by President Michael D Higgins. “That allows us now as a Government to bring forward the legislation to allow for abortion in Ireland in certain circumstances when the Dáil returns,” he said. Commenting on the ruling, Harris said the decision meant the Government could “get on with acting on the people’s instruction” to legislate for abortion laws. Posting on Twitter, the Health Minster added that while there was “lots of work ahead”, plans remained on track to begin passing the legislation. Email “Supreme Court decides not to hear challenge to 8th referendum vote, paving way for abortion legislation”. Feedback on “Supreme Court decides not to hear challenge to 8th referendum vote, paving way for abortion legislation”.